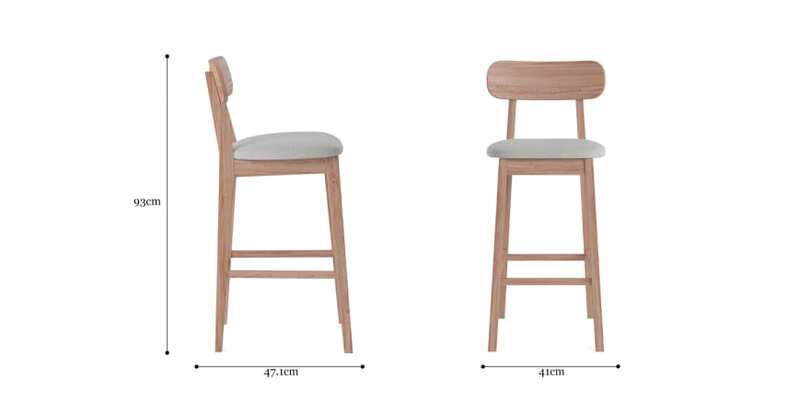 Create a relaxed and contemporary look with the Piccolo Bar Stool Set of 2. Bringing a practical yet stylish influence to an interior, the pieces come from the popular Piccolo Collection. A smooth curved back rest and comfortable seat work in unison to bring you a bar stool that you'll love to sit on. Discover more bar stools in every style from our range. Choose from a range of colours available for the Piccolo, with a shade to suit any interior! Everything from Denim Blue to Biscuit Beige is on offer. The Piccolo is made from high quality materials including Solid Beech, which is known for its strength and support. Match the piece with a range of dining tables. What are the seating dimensions? What is the distance between the legs? See, touch and feel our fabrics used on our Piccolo Bar Stool Set of 2. For Free! Simply select up to 3 fabrics and add them to your cart. Delivery is on us.